Hello my decorating divas! I hope you have all had a fabulous week and a fun, relaxing weekend planned. I am so excited to share my July Guest Blogger post with you. As with so many of us, Kim Converse is a creative who has always pursued her artistic side but as a hobby. She is now able to do what she loves full time but her current creations are quite diverse from her original textile artistic productions. As you know I love to include a touch of whimsy in my décor and I know many of you do too. You are going to love Kim’s creations and I’m excited to hear your feedback and comments. 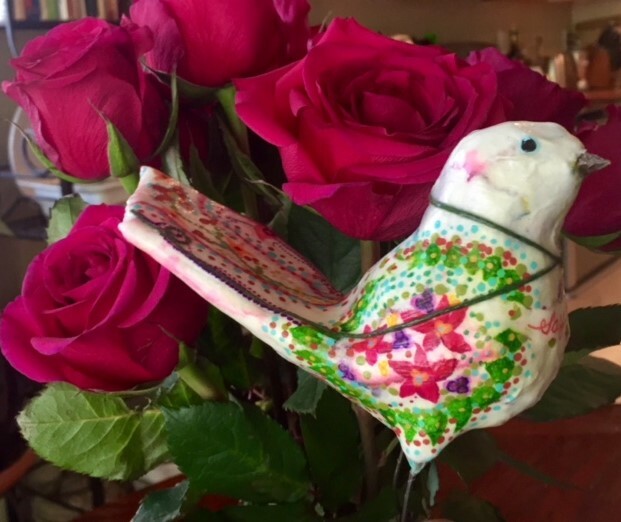 Read on to learn more about Kimbirdart and I dare you not to smile when you see these cheery little guys and gals. No, but I’ve always wanted to be an artist. In my teens and early twenties, I wanted to be a textile artist. I wove tapestries, I hand stitched embroidery with patterns that I created and occasionally dabbled with batik. My Kimbirds each wear a decorative thread. I guess the textile artist desire runs deep. I’ve been self-taught in my artistic pursuits. As my life progressed I set the artistic endeavors aside to tend to more practical aspects of daily life. I’ve done a variety of jobs; from waitress work to housekeeping and elderly care giving. I spent 10 years as an administrate assistant to the owner of a Land Surveying Company. From there I went on to become employed as a Bible College Administrator. I attended the Bible college and earned a bachelor’s degree in Pastoral Leadership. I’m an Ordained Minister and have served as an Associate Pastor. What attracted you to creating your birds? Creating Kimbirds was not something that I would have imagined I would be doing. I was not an avid bird watcher. Several years ago, while shopping with my sisters, I was looking for something new and cute to use to decorate my home. I had an idea that I would get a bird. Not finding anything to suit me, I got an urge to make my own. How did you transition to producing these creations? After searching the internet for decorative birds, I found a few that looked interesting made from papier-mache. YouTube instruction videos have been a tremendous help. The first bird made in 2013 looked pretty rough. With encouragement from family and friends I continued to produce; one bird and then another. After refining the process for a basic bird I began to get creative in other ways. I wanted the birds to carry a message so I incorporated a banner or tag with a message. Then I got the crazy idea for birds impersonating people. I made western gun slinging birds and Mexican bandit birds. Both a friend and my husband asked “What’s next Mariachi birds?” So, the challenge was on. The first group of Mariachi Birds was created. 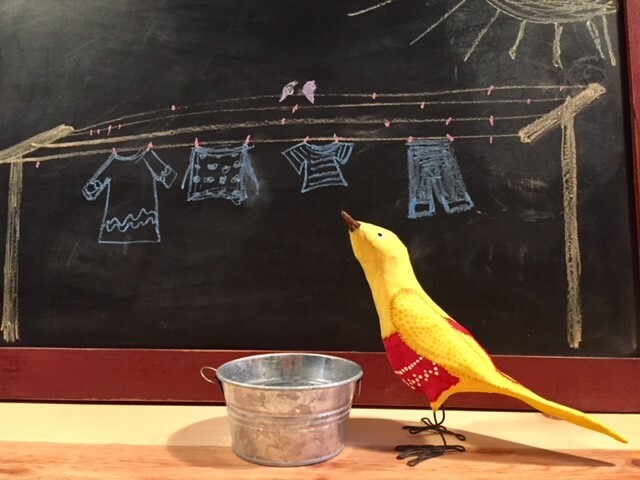 Some of my favorite Kimbirds have included: Pirate birds (sparrows gone rouge); Little Red Riding Hood; and, a Bird-Hunting Bird in camouflage. Are there skills from your previous work life you have made use of in your artistic biz? Definitely computer abilities for research and making connections via the internet and administrative skills have been helpful. Incorporating Bible scriptures on birds is an aspect of ministry that continues. In addition to skills developed, making art draws from who I am, from my personality, values and imagination. That’s the difference between art and making a trinket. Looking back, I see how each set of experiences prepared me for the next. As a late bloomer, I feel as though I’m finally getting to do what I’ve always wanted to do...I just didn’t know it would be in the form of bird art! What are the biggest challenges of your artistic biz? The marketing aspect is the most challenging. I’m just taking it one step at a time. I believe the future will become increasingly prosperous as I continue to learn. What gives you the greatest joy and pleasure of your artistic biz? I can never predict exactly how each bird will turn out. It’s always a fun surprise to see the personality that emerges in the finished bird. I get excited about fresh new ideas. I’m very inspired to see the diversity of people that the birds appeal to. A Kimbirds admirer is not defined by a particular generation, gender, nationality or station in life. I get joy out of turning a mood around and bringing a light-hearted moment with a Kimbirds creation. How/what do your creations contribute to interior decor? Kimbirds are lively additions to any decor, they are great at prompting conversation when you’re entertaining guests. As free-range birds they are cool to have in unusual places; like on your dining room table. A bird with an encouraging message hanging out on your desk, next to the computer screen, will keep you company while you work. Place a bird on an end table or coffee table within reach because they are fun to admire while being held. Kimbirds are little lovelies when perched upon a shelf. They were originally conceived for interior decor and they are living up to the job and quite possibly a little more! You can find more pics of Kim’s creations and how to order them on her website at https://www.kimbirds.com. 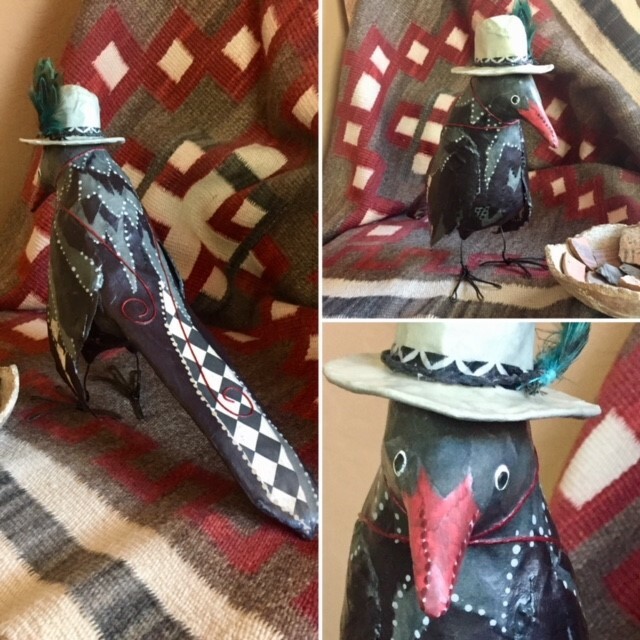 You can also find these whimsical characters on Facebook at https://www.facebook.com/kimbirdart/ and Instagram at #kimbirdart. And please share your comments and feedback - always great to hear from you all!